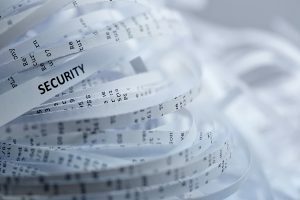 To nearly any business or individual, paper shredding is a dull but nevertheless necessary part of protecting yourself from risks like identity theft and fraud. When you need to shred documents, there’s always the option doing it yourself, but if you value things like your time, that’s where document destruction services come into the picture. Document shredding services are a convenient and cost-efficient alternative to self-shredding, and while their benefits may be well-known to many, the actual process for shredding services might not. With this in mind, here we’ve provided a step-by-step breakdown of our shredding services process, helping to guide you through understanding how our services ranging from drop off to mobile shredding work, and just how easy it can be to find reliable local shredding providers near your home or business. 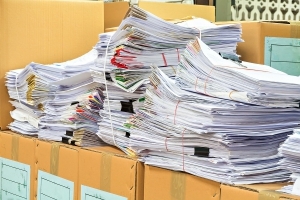 To get ready for a document destruction project some people may think they need to go through every individual paper to remove staples and the like, but in reality, the only real work to be done is figuring out how much paper you have to shred. With a basic office paper shredder, you will probably need to take the painstaking steps for prep-work to prevent jams, but the industrial shredders used with any of our services can handle as many as 20,000 documents an hour—chewing through staples, paper clips, and binder clips with ease. Typically the best document destruction service to fit your project is determined based on how many boxes or pounds of paper you have. A standard file box (15” x 12” x 10”) can hold between 2,000 and 2,500 sheets of paper, and weighs 30–35 lbs. If however you use a different storage method—like on shelves or in filing cabinets—and instead need a different way to figure how much paper you need to shred, you can also find help with Shred Nations’ shredding helper tool. With it, we can not only calculate the number of boxes and weight you have, but also provide the most cost-efficient shredding service to meet your scheduling, security, and budgetary needs. 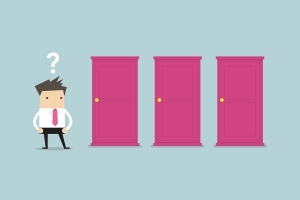 While our shredding calculator and helper tool can guide you through figuring out how much paper you have and directly connect you with the ideal service to match, some may still be interested to see the larger overview of our services and how much they can expect them to cost. Drop Off Shredding – Best for those with paper amounts ranging from a few sheets up to 3 boxes, these projects are ideal for drop off shredding particularly in terms of price. The average nationwide pricing is $1 per pound. Mobile Shredding – Ideal for 3–10 boxes, mobile shredding avoids needing to haul documents to a location, instead having a mobile truck come to your location to shred on site. For up to 10 boxes (300 lbs), the nationwide average is $119. 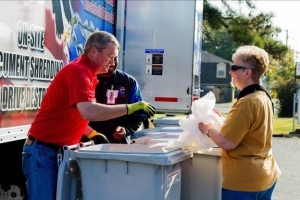 Community Shred Events – Shredding events offer communities and businesses the opportunity to take advantage of mobile shredding’s benefits at a more affordable cost. Hosting an event is a great way for businesses to advertise in their area, and for residents and organizations to come together and protect members of their community from identity theft or fraud. Off Site Shredding – Best suited for projects of 10+ boxes, providers still come to your location to pick up documents, but instead take them to an off site facility for shredding. Because no time is needed to shred on site, the service becomes increasingly cost-efficient the larger the number of boxes you need to shred. Hard Drive Destruction – When businesses and individuals need to shred more than just paper, hard drive destruction services are also available to handle destruction, disposal, and recycling for hard drives and other electronics with sensitive information. Once you determine the right document destruction service to suit your project needs, the last step to take as a customer is simply selecting a provider and scheduling a date for service—from there we can handle the rest. Begin by filling out the form to your right or just giving us a call at (800) 747-3365 to request a list of free document destruction quotes. Afterwards, our representatives contact you, providing with multiple pricing options from contractors in the area. Among these you can evaluate and select the right shredding service and nearby provider to meet your project budget, volume, and location. Once you schedule with a shredding provider, depending on your service our contractors will either come to you to shred documents on site for your convenience, or you can instead have them picked up for shredding at a secure off site facility. During the document destruction process, papers are shredded using industrial cross-cutting shredders. Once the process is complete, paper shreds are finally recycled and turned to pulp for sustainable future reuse. If on the other hand you only have a few sheets of paper to shred and don’t necessarily want or need to schedule an actual service, you can also always opt for drop off shredding, which may be the most convenient of all available options. With drop off locations throughout the nation, there may be one as close as just a few miles from your house or even one you’re passing each day on the way home from work—making drop off ideal for shredding small amounts of documents when all it takes is a five minute stop. On your end, once you schedule with a shredding provider or take your documents to a drop off location the process is essentially complete and no other work is required—however this doesn’t mean we don’t still have something to offer for you. 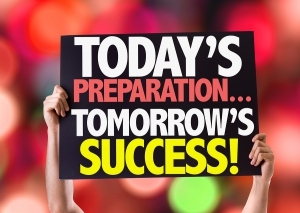 When the project is finished, your provider can give you a certificate of destruction. A certificate of destruction details the shredding process, including the specifics on chain of custody as well as who did the shredding, where the shredding was done, and when the shredding was completed. Additionally, providing a certificate of destruction post-shredding helps to ensure the project was completed in accordance with state and federal laws and regulations for document destruction such as HIPAA or FACTA. Get Free, No-Obligation Quotes on Shredding Services for Your Project Today! Document shredding services are a great way to make shredding your files both time-efficient as well as convenient. Whether you’re using mobile shredding services or instead taking your documents to a drop off location, the process is a simple one—and the perfect remedy for the headaches of doing shredding yourself. At Shred Nations, we partner with a nationwide network of reliable, local shredding providers, helping to connect those in need of document destruction services with the contractors and companies who can get the job done whatever your project requirements may be. To get started with either scheduling with a shredding service or comparing quotes for your project today, fill out the form at your right or just give us a call at (800) 747-3365 for free document shredding quotes from providers in your area.